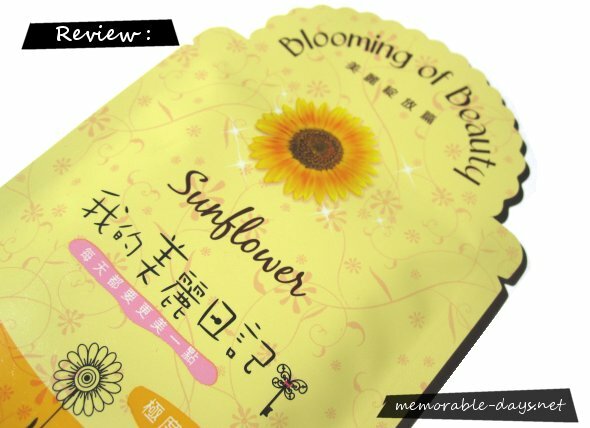 Review: Blooming of Beauty - Peruvian Sunflower | Memorable Days : Beauty Blog - Korean Beauty, European, American Product Reviews. 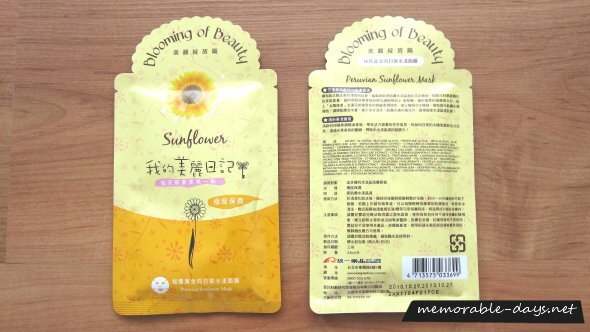 The peruvian sunflower mask claims to be extremely moisturizing. It is suitable for all skin types. It has a very cute packaging ^=^, cuter than the natural key line packaging! As you can see it's yellow & orange and there is a small sunflower on it. I'm loving the ruffled top as well! Btw. one box comes with 5 masks. It is lightly floral scented. I like the scent of this mask cause it smells so fresh ^o^. The amount of serum is just like the natural key line ones and there is yet enough serum for your neck. The size of the mask is the same as well. However, this mask felt a lot softer than the regular masks of My beauty diary which is a pro. Clean your face and pat it dry. Throw away the plastic sheet. Unfold the sheet mask and put it on your face for 20-30 minutes. When it's time to pull the sheet mask off, you gently massage the excess tonic on your face and wait till everything is absorbed. It has a nice floral scent, it's moisturizing and the mask itself is very soft. However, I just expected to be more moisturizing compared to the natural key line masks. Unfortunately, these were below my expectations. This mask didn't blow me away, but I don't regret buying it either. My skin did feel soft after usage and it's overall a good mask, but I don't know if I would repurchase it since it's more expensive than the natural key line masks and I have enjoyed other masks more.